On the fourth floor of Clifton’s Republic in DTLA sits its tiki bar, Pacific Seas. Even with a speed boat docked in the center, the darkly lit space is much less a tacky-faux-Polynesian experience and more of a distinctly Southern California-meets-midcentury-tropical one. It’s delightfully retro—and so are the drinks. 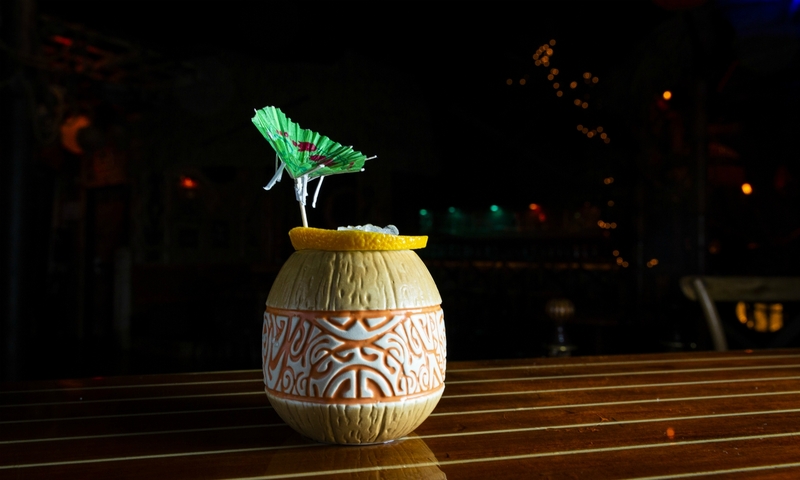 Over the years, nearly every tiki drink has been bastardized. Chain restaurants and cheesy beach bars turned them into cloyingly sweet, yard-glass drinks. Pacific Seas uses classic recipes and even improves upon them, staying true to their original tiki essence, but making them more drinkable. We tried all of their signature tiki drinks, most of which had several layers of bright, vivid flavors. We’ve all had a piña colada, but have you ever had one with vodka instead of rum? The Chi Chi is just that. It’s basically a vodka piña colada with pineapple, lemon, and coconut cream. 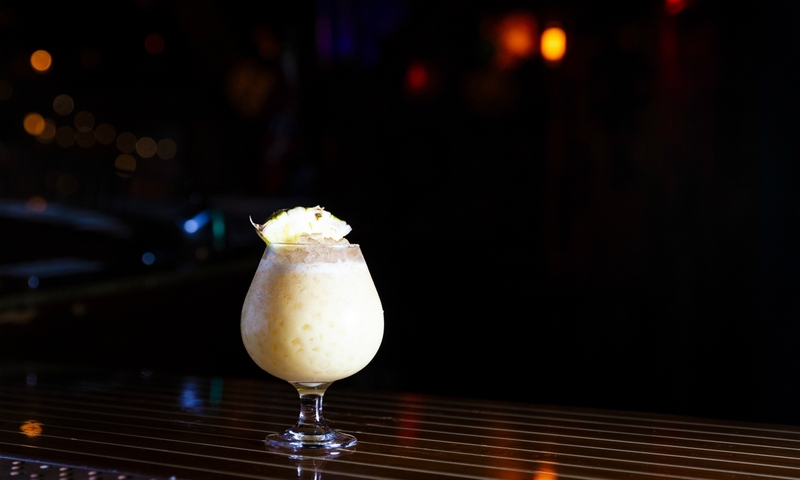 It has all the makings of a piña colada—but rum drinks are still king on any tiki menu. The Singapore Sling is another non-rum drink. It’s a gin-based cocktail with orange Curacao, Heering cherry liqueur, Benedictine, pineapple, lime, grenadine, and bitters. The ingredients give this drink substance not found in the Kool-Aid-like variations you may have tried elsewhere. The flavors are complex and balanced. The Blue Hawaii was created in Waikiki in 1957 as a marketing ploy for blue Curacao. It’s made with vodka, pineapple, orange, lemon, coconut cream, and blue Curacao, which gives it that beautiful blue hue. Though it’s made with vodka instead of rum, it’s sweet and so damn pretty that it’s totally deserving of its place at the tiki bar. 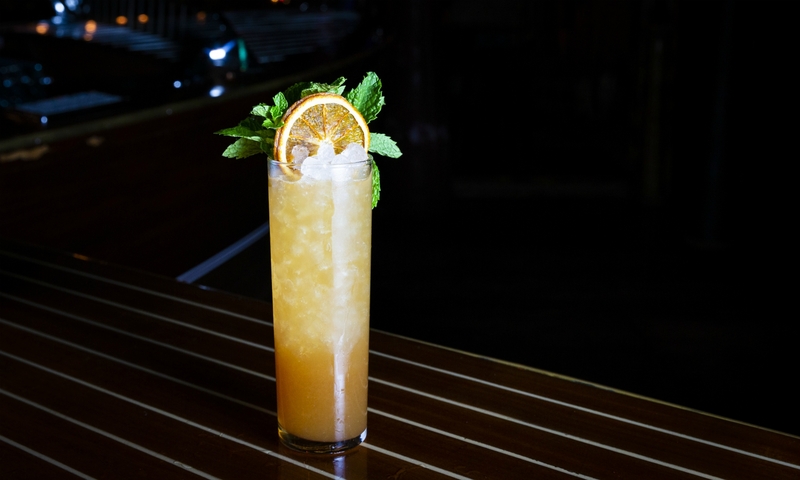 This Fog Cutter recipe is based on the Trader Vic’s version from the 1940s. It has rum, cognac, gin, orange, lemon, orgeat, and sherry. It’s surprising how well all of these ingredients go together and create a nice vibrant, tart flavor—like a worldy lemonade. And, hey, if you like the ceramic mug it comes in, you can purchase one at the bar for 20 bucks. The “Grog” dates back to 1740 when it was served to the British Royal Navy in an effort to ration their rum allowance. 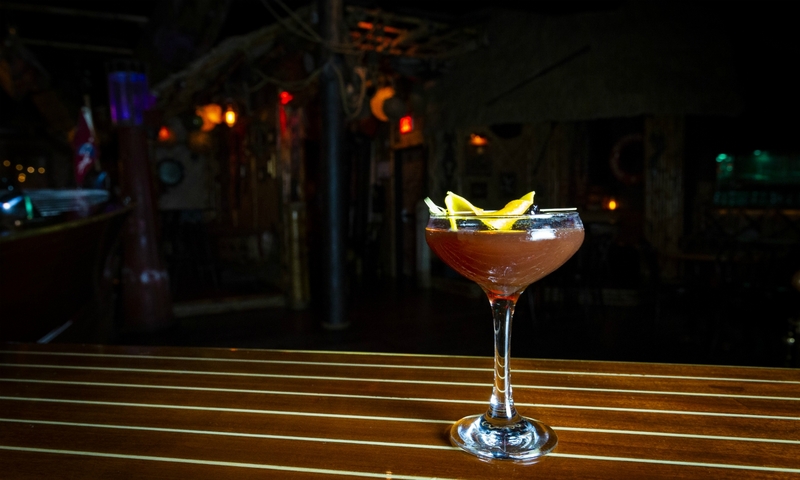 In 1941, a tiki adaptation was created: the Navy Grog. It has Martinique rum (rhum agricole, if you want to get nerdy about it), Jamaican rum, Demerara rum, lime, grapefruit, and orgeat. The three different kinds of rum each have their own distinct flavors, especially the aromatic Martinique rum. It’s made from fresh sugarcane rather than molasses, which gives it a fresh, grassy flavor that stands apart from the richness of the other two. 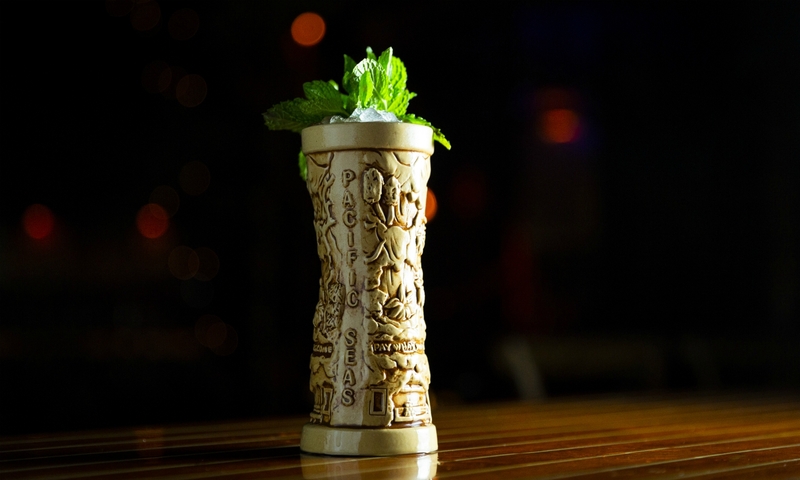 The Zombie is one of those cocktails that every tiki bar has a version of, and each version can be wildly different from the next. Created in 1934, it’s named for the effect it has on its drinker. Don’t let its reputation stop you from ordering it, though. 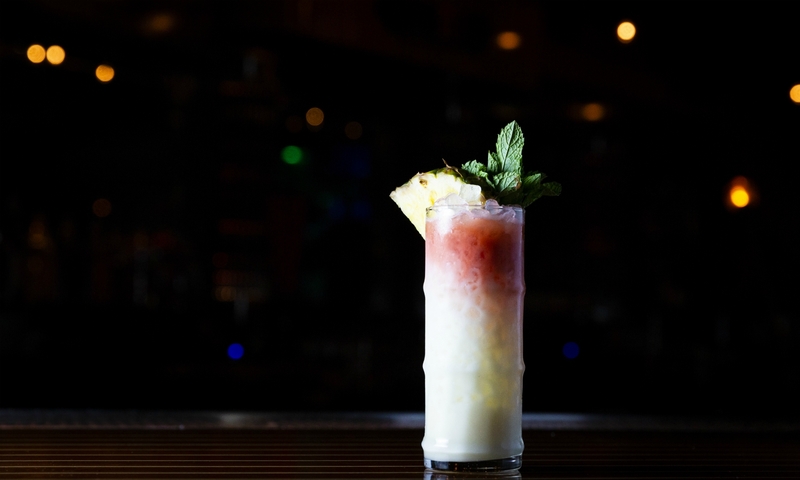 The Pacific Seas’ Zombie is one of the more civilized interpretations of this classic cocktail. It’s made with three kinds of rum, the sweet tropical syrup falernum, lime, grapefruit, and cinnamon, all in perfect proportion. The Trade Winds, besides being delicious, is another drink that comes in a fun mug. This has the bar’s house-made pineapple rum, white rum, lemon, apricot, and coconut cream. It has a fruity and coconutty sweetness that makes you want to order more than one. And—bonus—it comes with an adorable little wind-blown umbrella. 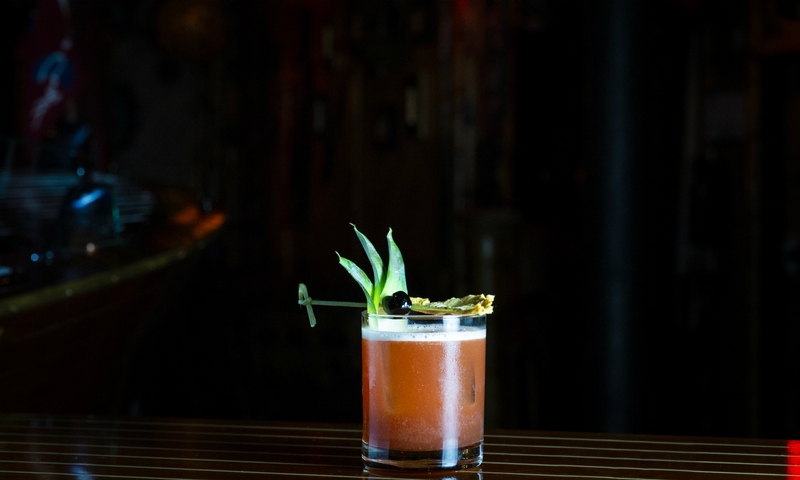 The Terra Incognita is the tiki version of a manhattan—instead of whiskey, it’s got rum. This is a no-frills tiki drink that doesn’t try to hide behind coconut creams or citrus-y flavors. It’s all booze: 12-year aged rum, Jamaican rum, vermouth, and a blend of bitters. 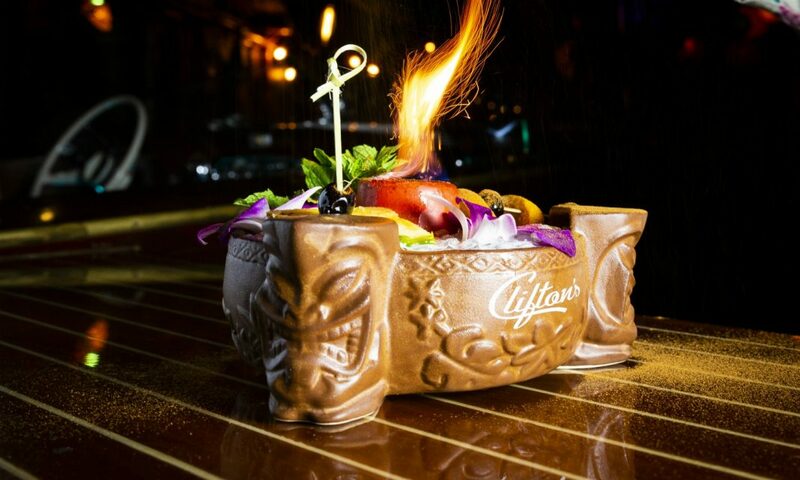 Perhaps the bar’s most ostentatious drink, the Scorpion Bowl is not only served in a gigantic vessel, but they also light it on fire. It’s got a lot of booze (rum, gin, and cognac), a blend of citrus juices, and a sprinkle of cinnamon on top. It’s flashy, even by tiki standards. Technically it’s made to share between three to four people, but there’s a legend of one bar patron finishing the entire bowl by himself. So, it’s possible, though it’s not something we encourage. Our favorite of the coconutty cocktails is the Painkiller. It’s got coconut cream, pineapple, orange, rum, and freshly grated nutmeg. 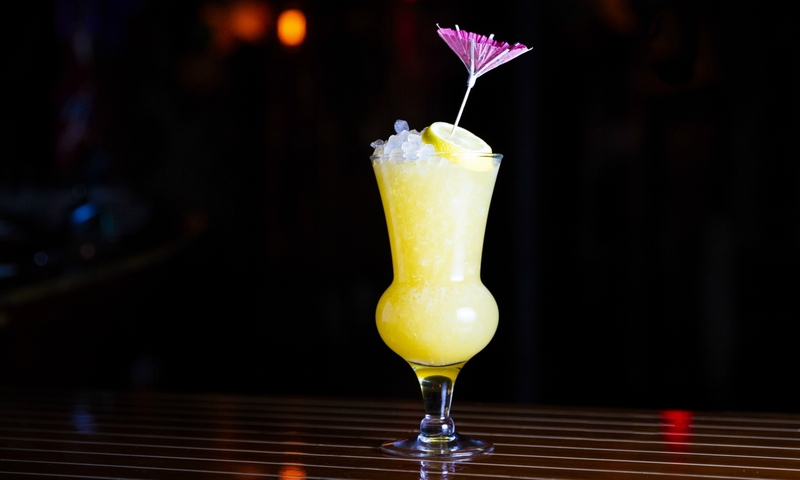 As the third most popular drink at Pacific Seas, there is a breezy quality to it. It’s rich pineapple and coconut, and finishes with a hint of spice. These flavors are exactly what come to mind when you think of tropical drinks. And, fun fact: Nutmeg is known for its anti-inflammatory properties, so this beverage could actually alleviate pain in more ways than one. 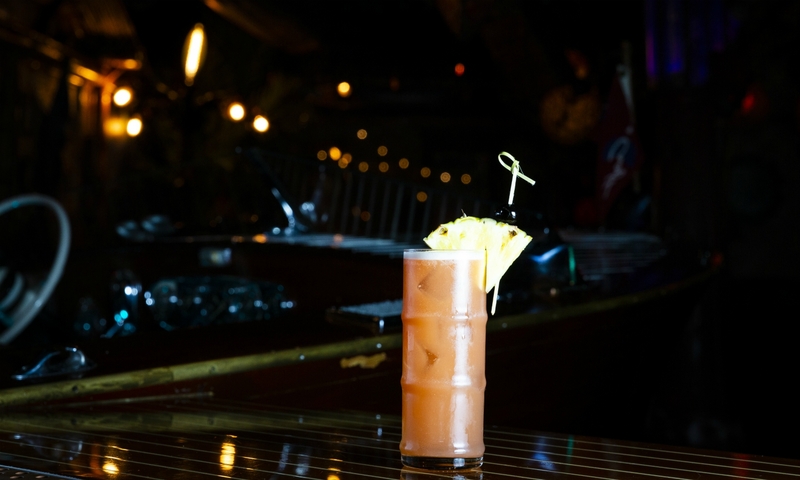 The Hurricane is the second most popular cocktail at Pacific Seas. This version of the classic New Orleans cocktail doesn’t stray too far from the original. 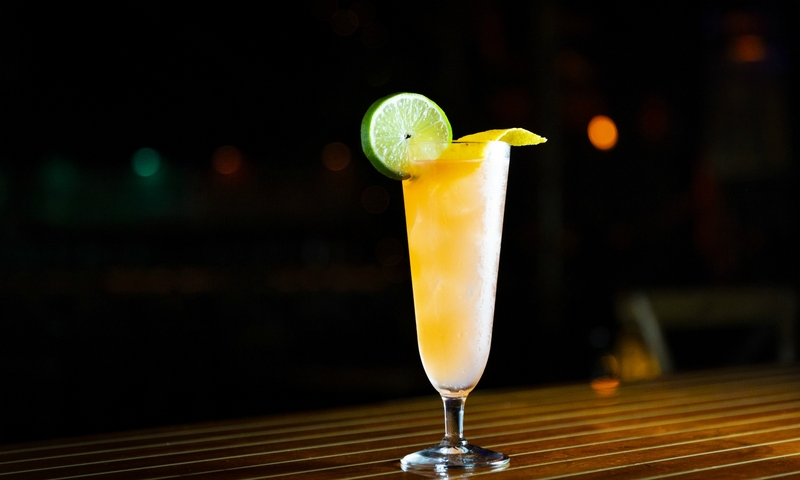 It’s made with a blend of rums, salted passion fruit, and lemon. It’s tart and fruity, and the salted passion fruit gives it a particularly exotic flavor. The Jungle Bird had the most unexpected layers of flavor. It’s made with rum, Campari, pineapple, and lime. There’s a strong molasses flavor from the rum (think pancakes), a sweet citrus flavor from the fruit, and it finishes with a gentle bitterness from the Campari. And we’re suckers for a pretty garnish. The margarita does not have to be your go-to tropical Mexican cocktail. Another traditional Mexican cocktail is the Paloma, and this rendition is made with mezcal and tequila, jalapeño, grapefruit soda, and a blend of apertifs. It starts with a crisp citrus flavor and finishes with a spicy heat. 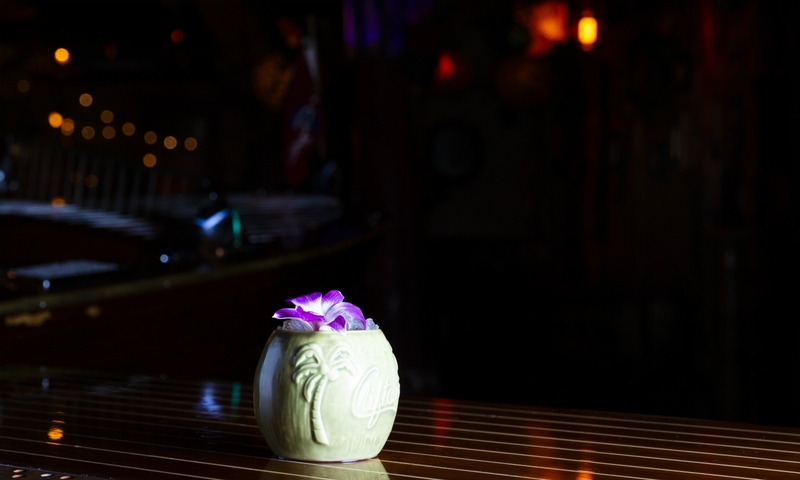 This is arguably the world’s most popular tiki drink, and it’s definitely the most popular drink at Pacific Seas. 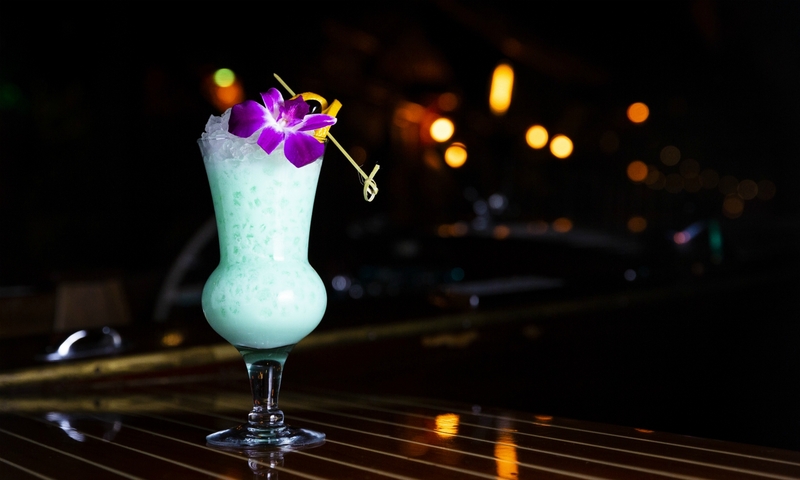 Their version is similar to the Trader Vic’s recipe created in 1944. It’s made with Jamaican and Martinique rums, lime juice, orgeat, and Curacao. The flavor is cleaner without all the sweetness that some of the other drinks have. 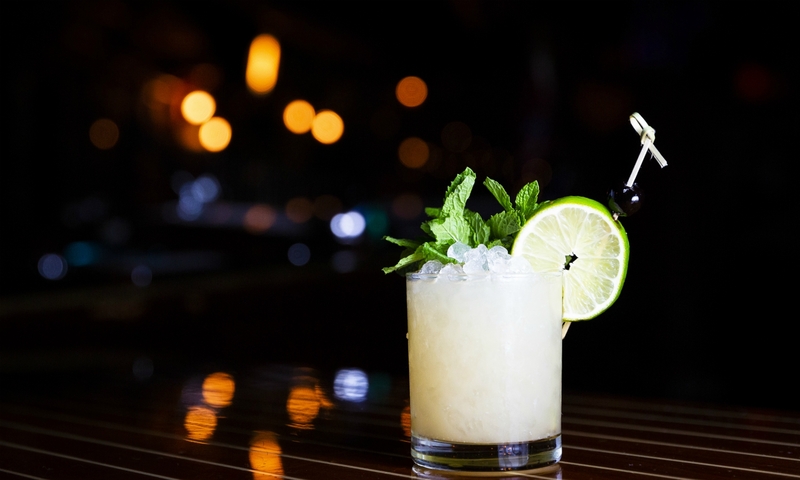 The lime and rum give it a bright tartness that epitomizes the tiki drink flavor profile. If your experience with daiquiris includes an overly sweetened frozen mix, a giant glass, and a two-for-one deal, then you’re doing it wrong. True daiquiris that stem from the original Cuban recipes are simple and balanced. 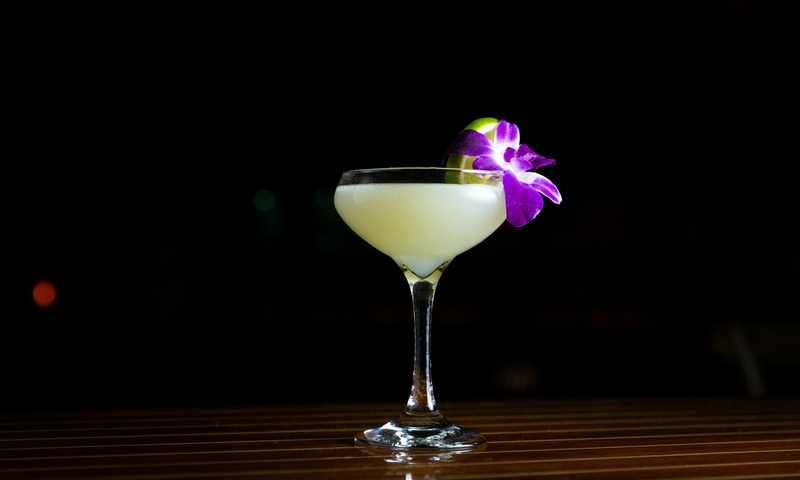 The Pacific Seas daiquiri is a one of those. Made with white rum, lime, apricot, vanilla, and cinnamon, this daiquiri is super refreshing and has an elegant spiced flavor. It may not come in a big mug or come to the table lit on fire, but it was our favorite signature drink for its uncomplicated flavor and effortless presentation.